International Mountain Day is a United Nations observance to raise awareness about the importance of mountains to the world's habitat and to encourage international cooperation to maintain proper balance when using the resources that mountains provide. Over 28% of the world's closed forest land lies in mountain regions, and they supply freshwater for over half of the world's population. 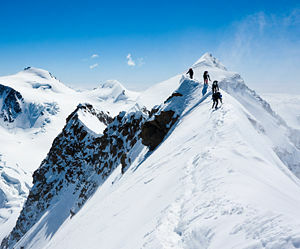 The inspiration for this holiday dates to 2002 which the UN declared as the International Year of the Mountains. Soon thereafter, the General Assembly declared December 11th to be International Mountain Day. From the records on the UN's website, it appears that it was first observed in 2004. Each year, the UN selects a theme. In 2011, it was "Mountains and Forests." This page was last modified on 22 December 2012, at 10:49.